"Paleo kale chips. I divide this in to two batches. My husband likes garlic, I like without garlic." Put kale in a bowl and add coconut oil; mix with your hands until evenly coated. Spread coated kale onto the prepared baking sheet. Sprinkle garlic salt, salt, and pepper over kale. Place baking sheet in the oven and turn off oven. 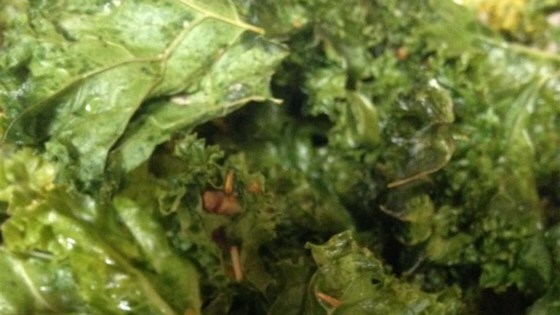 Leave kale in the oven until crisp, about 20 minutes. I used some chipotle seasoned salt for a little extra kick... yum! Absolutely delicious!! Add some ginger, himalayan pink salt, and grind some black pepper! It was pretty good. I am always looking for new healthy side dishes. Need to make sure the pan isn't too crowded for every leaf to crisp nicely. Yum!!! The guys couldn't wait to eat them when I grabbed them out of the oven. This is the best and easiest recipe of all the ones I've tried. I always burned my kale chips before—love how you turn off the oven and these get perfectly crisp without burning . Baking while the oven was off is a bit of brilliance... not only quick, but it better avoids over heating. I added grated Parmesan cheese before baking which worked just fine.